Many blessings on this magikal day, may it bring all that you wish for and more. 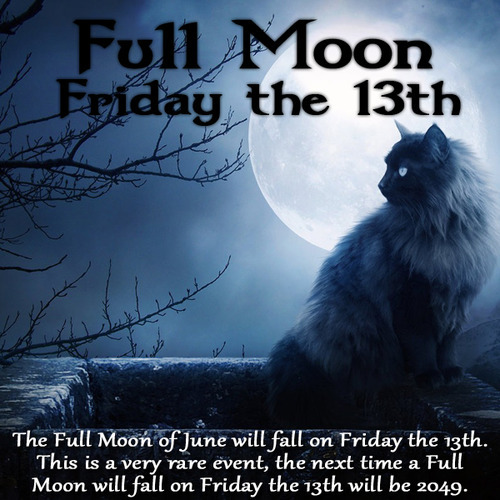 A magikal event will occur on Friday June the 13th, an a rare occurrence it is also a full moon. The chances of both these things occurring on exactly the same date is incredibly rare, and will not happen again until 2049! Many people consider Friday the 13th to be seriously unlucky, and even those who are not normally superstitious, may be drawn into feelings of anxiety on this day. Others may view Friday the 13th as a magikal date, full of heightened, feminine energy. Because some people expect the worst, the law of attraction starts to work against them, and their luck really does turn bad. Also because other people’s energy is contagious, these negative vibrations, and feelings of unease, begin to spread like wildfire, and before we know it, the superstitions around this date come true! When the moon is full, it is also a time, when the energy that surrounds us seems to shift. I have a friend who works for a psychiatrist and she tells me the full moon effects many of their patients. On a full moon, you might have difficulty concentrating and be more likely to suffer from headaches, migraines and other neurological disorders. The important thing is to keep calm, stay grounded. Try not to make any big decisions, err on the side of caution, be sure to stay hydrated and give yourself permission, to take some time out for you. Trust in your intuition of what is right for you. Spiritually, it’s going to be a great time for manifesting abundance into our lives. A lovely simple treat for bringing luck and prosperity is by making a hot drink of spiced cocoa. Why limit ourselves to some symbolic actions when you can do something good for yourself? This is a very simple recipe, and can be done both hot and cold. Just take some cinnamon, star anise and nutmeg (a good proportion is 3:1:1) and grind them all together in a mortar. Remember, this is a meditative ritual activity. Think about what You are doing and why. Mix the resulting powder with cocoa and some honey (or sugar) and prepare the drink as usual. You can add some whipped cream to make it even better and to symbolise wealth and prosperity. Then drink it. Seeing as cocoa has been medically proven to have anti-depressant properties, it is an ingredient for luck, and is delicious, this will help You on so many levels. And it’s not even all that hard on the figure!